While the wedding dress is the star of the night, the accessories take it a notch higher. What’s a wedding without a little lace and sparkle? This May 5-6, 2017, our main accessories designer, Sara Gabriel, is holding her trunk show here at Blue Bridal! It’s the perfect opportunity to check out the latest pieces and trends! As for brides who got their dresses at Blue, you can join us for the Sip & Style Soiree on May 6, for amazing discounts on accessories. Each bride has her own unique taste and take on wedding veils, but worry not, because there are so many options to choose from — from regal trains, to muted elegance, to absolutely nothing at all. However, don’t forget to consider these three aspects when choosing: color, length, and style. Make sure your veil matches your dress. 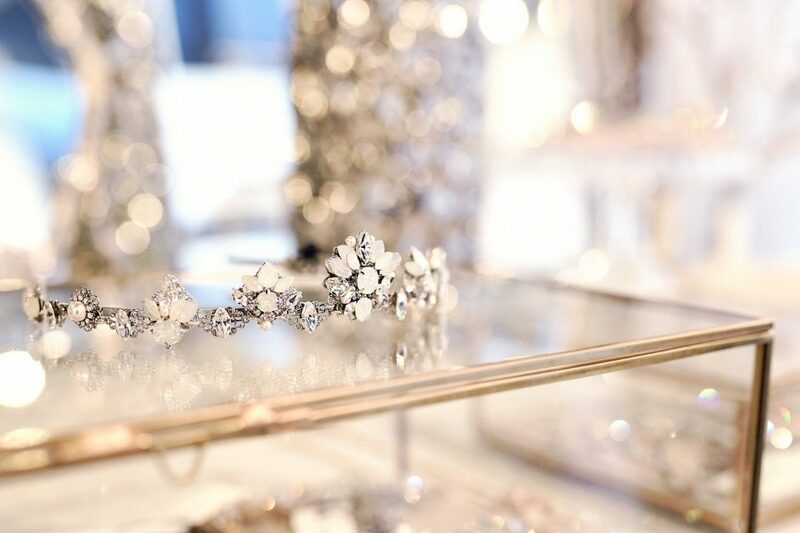 Individually, these pieces are amazing, but when put together perfectly, they can just create the ultimate bridal look. Create harmony within your look. If you’re going for an ivory wedding dress, gold jewelry would look stunning with those warm hues. If you’re into a pure white dress, then platinum, silver, and pearls would be your best bet! Taking your wedding decor into consideration would be a great idea as well, especially if you want to ensure a cohesive overall feel for when you get your wedding photos. It’s always a good idea to complement your surroundings — or better yet, let your surroundings complement you. Who isn’t a sucker for killer heels? While sky-high shoes are just absolutely perfect for pictures, they could take a toll on your ankles if you’re not used to them. Enjoy the rest of your ceremony and reception by going for both comfort and style. If you’re having a beach or garden wedding, then perhaps flats are the way to go! And then of course, there’s the unique bride who will go for sneakers over heels. You do you! It’s your day, after all. Sometimes, less is more. Remember that accessories are there to enhance your look, so don’t be worried about not having every single one of these items. Experiment, do your research, and find the ones that work for you and those that will make you feel more beautiful and confident. You deserve it!